© 2001 Artists Rights Society(ARS), New York/ADAGP, Paris. Photography by R.H. Hensleigh..
Born Gyozo Vasarhely in Pécs, Hungary, the artist took academic art training at Budapest’s Podolini-Volkmann Academy, then studied graphic design with Alexander Bortnyik at Mühely, the so-called Budapest Bauhaus. There Vasarely learned graphic techniques based on Constructivist principles and Ostwald’s color principles. He changed his name to Victor Vasarely after moving to Paris in 1930, and supported himself as a graphic artist until 1944, when he turned full time to painting. Vasarely’s plastic unity works were created with repeatable shape elements (squares, circles, ovals, rhomboids, and/or triangles) set within the units of a checkerboard grid that filled each composition. The artist methodically charted on graph paper each design variant, using color schemes based on carefully constructed lists of the values for each color he used. Each composition and each color “score” was recorded meticulously in an imagotlieque (picture library) notebook, with separate dates noted for the invention of each idea and its execution as a finished work. 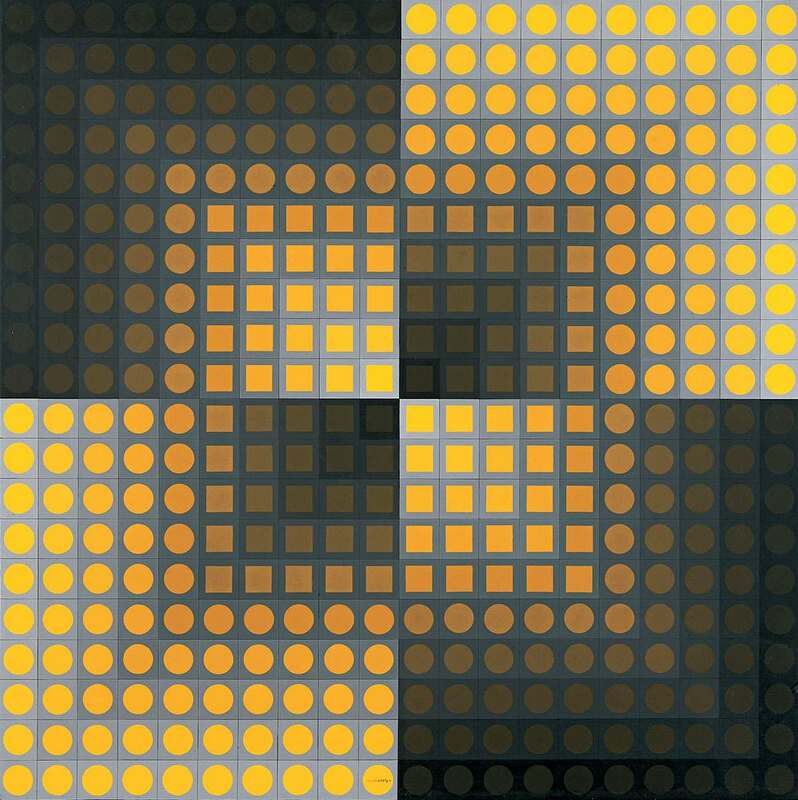 Toll is part of Vasarely’s Permutations series, in which the artist explored the optical effects of using a few shapes with gradients of two or three colors. In Toll, yellow circles occupy gray units in five outer nested rows, surrounding yellow squares in gray units of five inner nested rows. This pattern is countered by the division of the entire field into four quadrants, in each of which the yellow and the gray are taken through the color scale from light to dark (recalling the Ostwald color exercises that Vasarely did under Bortnyik in Budapest). In the upper right and lower left quadrants of Toll, the color scale moves from light at the outside to dark at the center. In the upper left and lower right quadrants, this is reversed so that the color scale moves from dark at the outer edge to light at the center. The result both optically warps the painting’s flat surface and creates an amazing luminosity emanating from within the work. At one moment the outer-lighted quadrants seem to be floating above a dark-rimmed grid that covers the whole format. The next minute, the four quadrants lie on the same dynamic plane, with their sharp center “points” jousting against one another. Toll is a mesmerizing image. It forces us to pay attention to how we see and find delight in the process of unraveling the tricks our eyes can play.